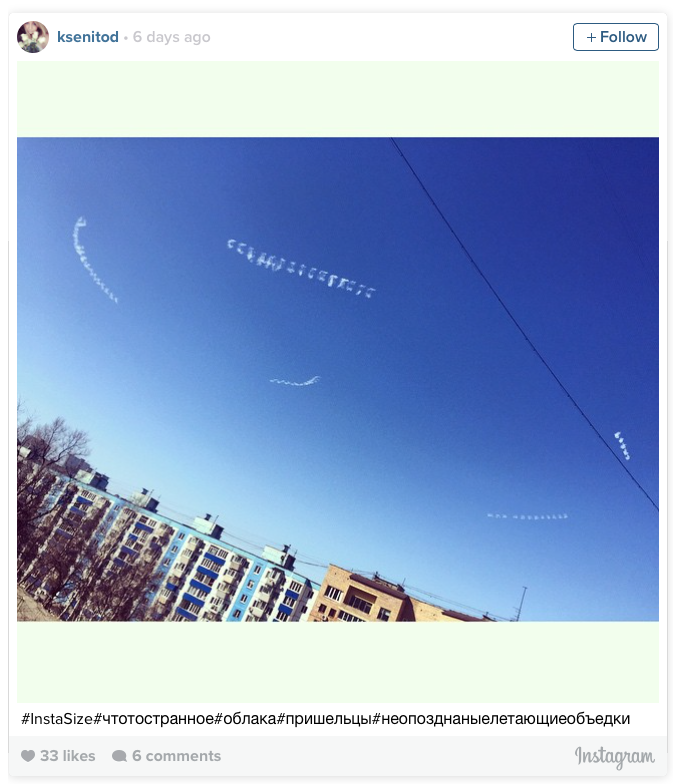 UFO SIGHTINGS DAILY: UFO Over Russia Gets Attention On Instagram and Twitter, Feb 19, 2015, UFO Sighting News. 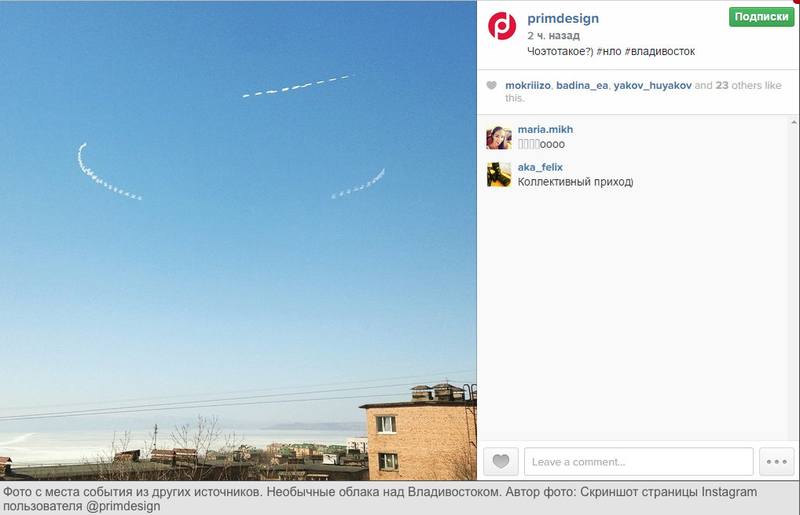 UFO Over Russia Gets Attention On Instagram and Twitter, Feb 19, 2015, UFO Sighting News. 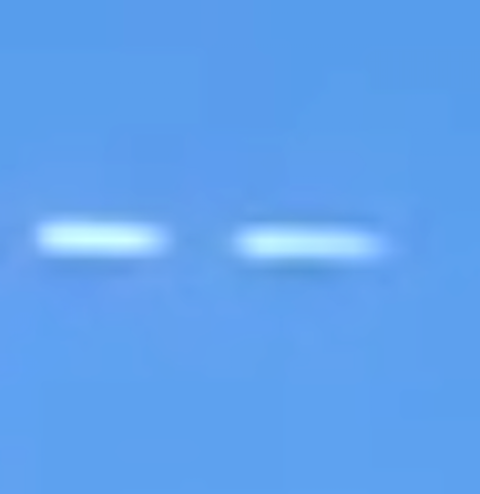 Guys, this is not a normal UFO. Its like a drone, but its soul purpose is to create cloud cover for UFOs. I saw 4 such things create 4 cloud tunnels above Rapid City, SD back in 189-1990, then glowing bus size UFOs shot through them. 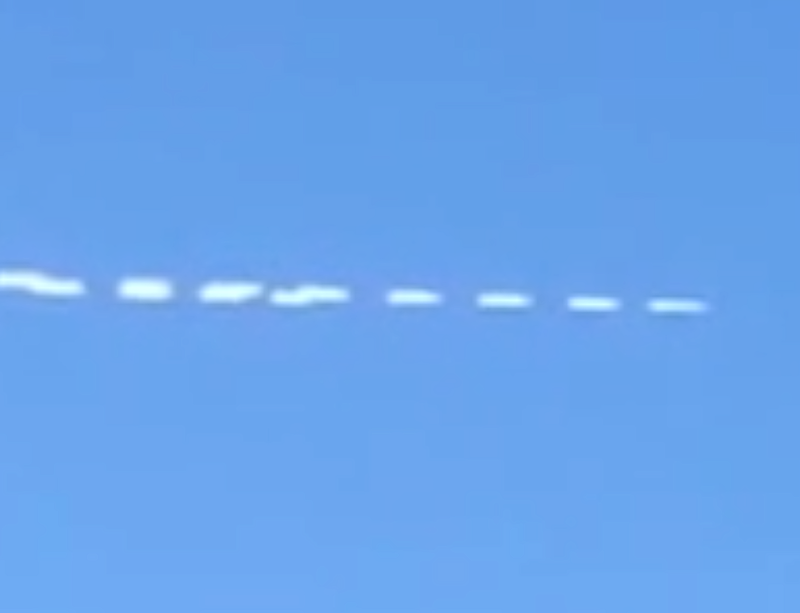 I believe this is a cloud maker drone, either learning or testing its new tech...much like a new printer printing out a test page or two before it starts normal work. Vladivostok, February 19, PrimaMedia. 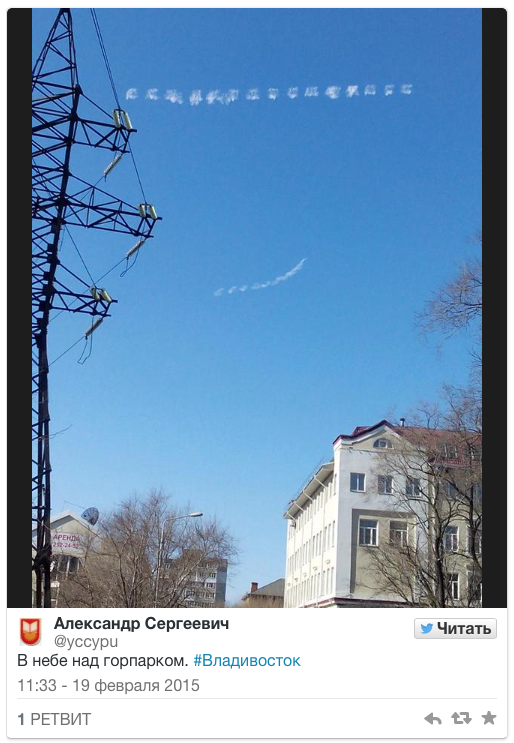 Users of popular social networks Twitter and Instagram got a surprise today, February 19, with the appearance of unusual shaped clouds in the sky over Vladivostok. In the photos, which appeared on the Internet more than a dozen tweets, and videos can be seen depicted quite remarkable "white circles", which immediately began to ascribe extraterrestrial origin, RIA PrimaMedia. Unusual cloud appeared over Vladivostok at lunchtime and instantly became an eye camera lens and gadgets of many citizens. Some expressed concern, if not a UFO has left its mark. Others argue that these bands could leave the plane. Unfortunately, the editors failed today to receive comments from meteorologists and physicists to discuss what could cause such an unusual form of clouds. Sure that all the laws of physics could explain it all, for example, thereby "effect of the Prandtl-Gloerta", which is most often remembered today internet users. We are talking about the origin of the clouds after the plane. 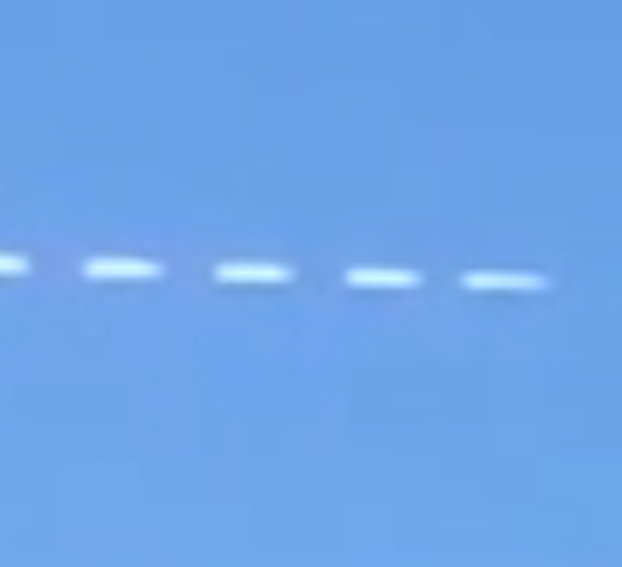 All the same plane? The emergence of the cloud due to the effect of the Prandtl-Gloerta depends not only on the speed of the aircraft, but also on the temperature and humidity. In normal or slightly elevated humidity cloud formed only at speeds close to the speed of sound. In extreme humidity effect can be observed at lower (transonic, "transonic") speeds.